I recently blogged about starting my shed project this weekend and how I had two friends who were able to help me. Well one of my friends has an emergency that requires his attention so he is unable to help out. I did confirm another friend’s availability but quite honestly….the stress of this whole thing is just too much. And I mean stress. The knots that are in my shoulders and neck make it difficult to turn my head. It’s not worth it. So I’m back to my original plan on waiting until the Spring. The plan was to buy the shed sometime in January or February and then only have a month or two to wait. 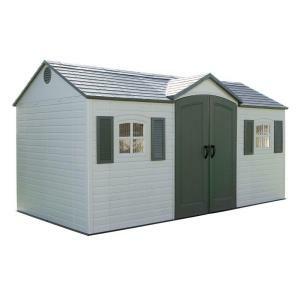 When I saw the shed go on sale for Black Friday, I jumped at quickly bought it, so excited that I had it early. The excitement took over and made me want it up and ready BEFORE winter arrives. So I frantically started planning for it which only resulted in the disaster of last weekend (you can read about that HERE). So then I began the stressful planning again for making it happen this weekend. Right. What was I thinking? So my new and final plan is to wait until Spring, where days will be longer and I can work on it a little each day. Preparing the ground is very important as I want the shed and area it sits on to last for many years. I also have a few other plans for outside once the shed is in place. I’d like to lay down a stone (or whatever) pathway from my back gate to my deck stairs, deck stairs to the shed, and deck stairs to the back door. My thought it by leveling the ground for the shed, it will not only prepare me for working with dirt, rocks, and tree roots, but it will also provide me with the necessary tools for Project Pathways. Of course I’ll still need someone to help me put the shed together but that’s because I can’t hold pieces together and screw them in by myself. So that’s the plan. I hope the stress knots will leave my shoulders and neck in the next couple of days. I'm that 1 in 8 person.